Once a year, giant robots from outer space come to Earth and bond with young cadets from the elite Sky Corps Academy to defend the world from the terrifying aliens known as the Sharg. It’s a great honor to be chosen, but this year...well, the wrong kid was picked. 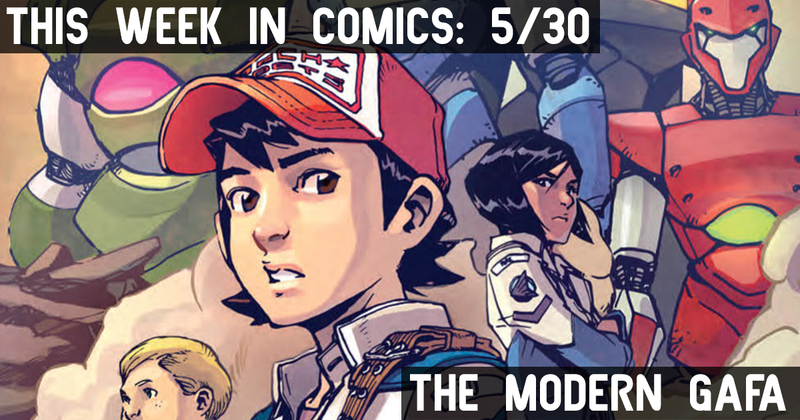 From Greg Pak (Totally Awesome Hulk) and Takeshi Miyazawa (Ms. Marvel), Mech Cadet U is the kind of comic that was made just for me. Kids staring in the face of danger, giant colorful robots, lots of kickass action, and a heartwarming story about the relationship between children and their parents. Vol. 1 collects issues #1-4 and an exclusive behind-the-scenes look at the making of Mech Cadet Yu, including the comic short story that inspired the series. It’s available at your local comic shop this week and everywhere next week. Pre-order your copy on Amazon by clicking here. War is a spectator sport in this futuristic action series. Satta Flynn’s glory days are behind him, but he just refuses to die on the battlefield. When the omnipotent coordinators of the game stage a plan to get rid of him, everything goes to hell. With shiny new - and totally sabotaged - gear, Flynn comes face to face with some obstacles he wasn't quite expecting. Like, for example, a giant robot made of junk! VS is beautifully drawn and tells a gripping story of the most dangerous game - and it’s crazy good! This issue of the sci-fi superhero team reboot gives us the origin of Aphrodite. Fifteen years ago, Dr. Morrigan sought to create artificial intelligence. The project was funded by Cyber Data who quickly became frustrated with her lack of tangible progress. After threatening her life and taking her lover’s, Morrigan figures that if she can’t create digital life then she will transfer her own life into data and give life to Aphrodite - part human, part machine, all killer. My favorite part of this issue was that Dr. Morrigan, a woman, fell in love with another woman. And nothing is said about it. It wasn’t trying to make a point or prove anything. It just showed that queer people exist. And you better not mess with them. This is a short graphic novel about a small girl named Laila who is going through some problems at home partially due to her parents splitting up, partially due to a Dodo that she snuck into her house. It starts off cute and then hits you over the head with feelings. Out this week in comic shops and everywhere next week. Pre-order on Amazon by clicking here.